A wildly humorous fable of competition, betrayal and unstable seasons presented as a post-apocalyptic vaudeville, Dog Act features a comic assortment of wayward travelers, each on a quest to survive a world that has been turned inside out. 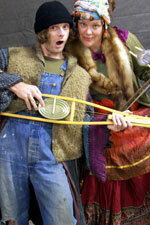 With its transient gypsy spirit and fantastic musical numbers, Dog Act is a perfect fit for the Shotgun ensemble. In Dog Act playwright Liz Duffy Adams explores nothing less than the collapse of modern civilization. With sharp humor Adams creates a culture that falls in the cracks, where written knowledge has evolved into a cockeyed set of sly rituals and mutated phrases. Adams work is extraordinary in its ability to create freshness out of discarded traditions. Much like Shakespeare did, she creates something entirely new out of the things we have left behind. Shotguns commitment to fostering new work, and to the creation of relationships with emerging playwrights has allowed great success in recent seasons, and the world premiere of Dog Act promises no less. Produced in collaboration with the Playwrights Foundation, and directed by Kent Nicholson, a prominent figure in development of new work in the Bay Area, Dog Act is essentially a modern vaudeville. 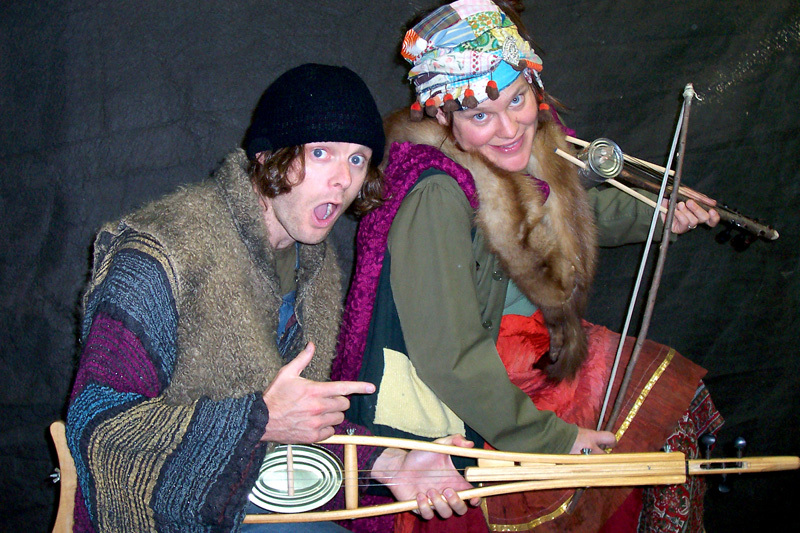 All the actors will play found object musical instruments of original design created by Stewart Port. (For more information on Stewart's work go here.) Shotgun Players was fortunate to get the rights for Dog Act after the interest and excitement it created at the 2002 Bay Area Playwrights Festival. 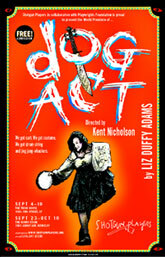 Dog Act features Shotgun Company members Beth Donohue and Dave Maier, as well as the talents of Eric Burns, Richard Bolster, Dianne Manning, & Rami Margron. Designers include Rob Anderson on lights, Valera Coble on costumes, Praba Pilar and Stewart Port on set. Director Kent Nicholson is well known in the Bay Area for his work with new plays, including Wet (also by Liz Duffy Adams) for the Bay Area Playwrights Festival, the San Francisco production of Five Flights for Encore Theatre company (named one of the top 10 cultural events of 2002 by the San Francisco Chronicle) and, Sacrament! (which he co-adapted with novelist/memoirist Dave Eggers) for Campo Santo. Previous Shotgun credits include Swimming in the Shallows and The Water Engine. Kent is currently the Director of New Works for TheatreWorks. NOTE: Please know that Dog Act employs creative profanity multiple times. Probably not appropriate for the little ones if they don't take their words spicy. Not suitable for kids under the age of 12. This show contains creative profanity. Thursdays-Sundays at 8pm until October 10. + September 23-October 10 at The Ashby Stage in Berkeley. The Ashby Stage is right across the street from the Ashby Bart Station. Beth Donohue is Zetta, and Richard Bolster is Dog in Shotgun's World Premiere of Dog Act. Yup. They're made by instrument maker Stewart Port. For more info on his work go here.